(August 25, 2015; PASCAGOULA, Miss.) 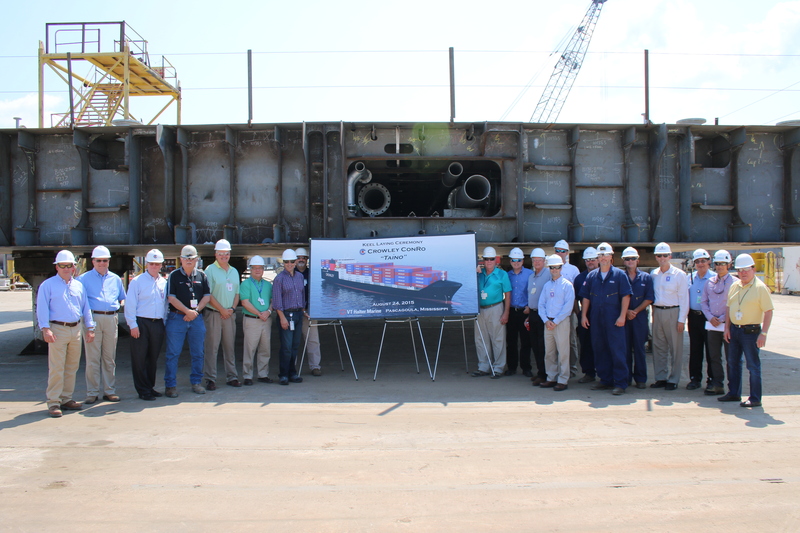 – The keel for the second Commitment Class liquefied natural gas (LNG)-powered, combination container – Roll-On/Roll-Off (ConRo) ship for Crowley Maritime Corp.’s liner services group was laid yesterday during a ceremony at ship-builder VT Halter Marine, Inc.’s facility in Pascagoula, Miss. The keel laying ceremony marked the next step in the construction of Crowley’s two Commitment Class ships, which will exclusively serve the U.S.-Puerto Rico trade lane. VT Halter Marine and Crowley entered into a contract for the pair of Jones Act ships in November 2013 and construction of the second ship began with steel cutting in Pascagoula on May 27, 2015. With the first section set in place, the ship will now begin to take shape as it is built around the keel. The first ship’s keel laying took place in January 2015. The Commitment Class ships have been designed to maximize the carriage of 53-foot, 102-inch-wide containers, which offer the most cubic cargo capacity in the trade. The ships will be 219.5 meters long, 32.3 meters wide (beam), have a deep draft of 10 meters, and an approximate deadweight capacity of 26,500 metric tons. Cargo capacity will be approximately 2,400 TEUs (20-foot-equivalent-units), with additional space for nearly 400 vehicles in an enclosed Roll-on/Roll-off garage. The main propulsion and auxiliary engines will be fueled by environmentally friendly LNG. The Commitment Class, Jones Act ships will replace Crowley’s towed triple-deck barge fleet in the South Atlantic trade, which has served the trade continuously and with distinction since the early 1970s. These new ships, which will be namedEl Coquí(ko-kee) andTaíno(tahy-noh), will offer customers fast ocean transit times, while accommodating the company’s diverse equipment selection and cargo handling flexibility – benefits customers have enjoyed for more than 60 years.El CoquíandTaínoare scheduled for delivery during the second and fourth quarter 2017 respectively. Crowley has served the Puerto Rico market since 1954, longer than any other carrier in the trade. The company, with more than 250 Puerto Rico employees, is also the No. 1 ocean carrier between the island commonwealth and the U.S. mainland with more weekly sailings and more cargo carried annually than any other shipping line.